Crane games (aka UFO Catchers or claw machines) are a big business in Japan. They seem to make up the majority of the machines in Japanese arcades, and there is an entire industry that basically exists to make prizes for people to win in those machines. While most of the claw machines you see in the US have pretty crappy prizes, these prizes are generally very high quality. These figures are a good example of that. While you can sometimes buy them outright, as I did, on Yahoo Auctions Japan or maybe from a seller on Amazon Japan, generally speaking they aren’t available at retail. Instead you need to win them. As you might imagine, this makes them kind of expensive when you are able to find them for sale. The figures themselves would probably fall under the “super deformed” category, since they have very large heads. They remind me a lot of the “Monstar Shop” garage kit I got last year, which was also from Japan. They are very well sculpted and painted. The humanoid figures are around 3″ tall and they’re made of plastic with no articulation. They each come with a black plastic base, but they don’t really need them to stand up, and the bases are so large that you can’t really display them very well together, so I’m not using them. 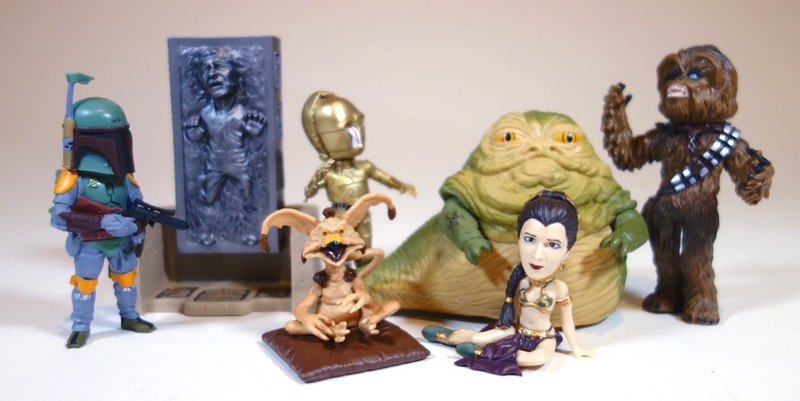 Although I bought this set, I was also able to win one of the Jabba figures in a crane machine on the site Toreba.net. It’s a site that lets you play crane games located in Japan over the internet. If you win something, they’ll send it to you. You have to pay for each try, and playing over the internet is definitely not easy, so it can get expensive. In the end it probably cost me more than it would have to buy the figure outright, but I thought it was fun and very cool to actually win one of these in the intended manner. 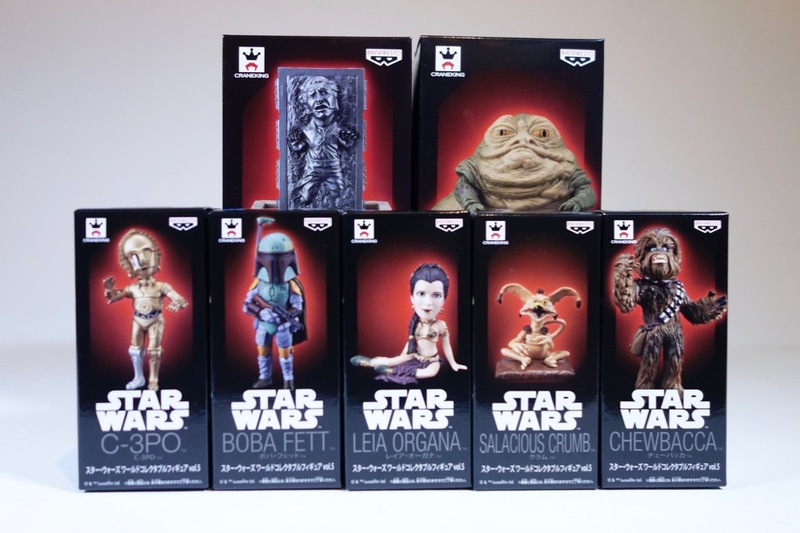 I made a video showing me unboxing these figures, and it even shows video footage of me winning the Jabba figure from Toreba, so check it out below if you’re interested.